The Castle was the seat, 100 years ago, of the 5th Earl of Carnarvon, who famously discovered the Tomb of the Egyptian Boy Pharaoh, Tutankhamun, in 1922 with his archaeological colleague, Howard Carter. Today, the 8th Earl and Countess have opened a new Egyptian Exhibition throughout the cellars of the Castle to celebrate the 5th Earl’s achievements. The 5th Earl of Carnarvon first travelled to Egypt in 1898. From 1906 he spent many winters in Egypt, and not merely as a traveller. He acquired concessions to excavate over 16 years near Luxor in the Valley of the Queen’s, the Valley of the Nobles, the Valley of the Kings, and in the Nile Delta near Alexandria. 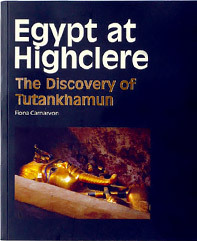 Lord Carnarvon both discovered and purchased Egyptian artefacts. He created one of the most extraordinary Egyptian collections in the world, with unique and exquisite works of art. Following his death in 1923, the collection was sold by his widow to the Metropolitan Museum of New York in order to pay death duties. Howard Carter had catalogued it and commented that he had left a few unimportant items at Highclere. Perhaps by comparison with some of the works of art sent to New York, the remainder seemed less significant. They were all tucked away in cupboards in Highclere Castle, until re-discovered by the family in 1987. The British Museum and Newbury Museum have kindly lent back further statues and antiquities, which had originally been lent to them by the Carnarvon family. The Antiquities Room is explained and illustrated so visitors can observe the jewellery, the faces and figures, the beautifully crafted jars and a coffin of a noble woman from 3,500 years ago. Lord Carnarvon and Howard Carter worked together for 16 years. They often planned their excavation season in Egypt from Highclere Castle. Lord Carnarvon had helped Howard Carter build a house in the desert not far from the Valley of the Kings, which was nicknamed 'Castle Carter'. Lord Carnarvon sometimes stayed there just as Carter sometimes stayed in Highclere Castle. Visitors can see what happened to the Castle and family during the Great War from 1914 to 1918. After 1918, Lord Carnarvon found his financial situation was becoming increasingly difficult. Both men had been ill and were becoming discouraged, with very little to show for long hours of effort and toil. Yet Lord Carnarvon and Howard Carter had been convinced that there were yet more tombs to be found in the Valley of the Kings. They had created a system of grids to cover the ground in an organized way. The decision had fateful consequences for both men.